A dark circle eye cream will help protect our aging eye zone. Many quality eye creams are available on the market that is specifically formulated to target dark circle under eye problems. Many beauty companies offer a multi-tasking eye cream that can treat a combination of problems such as swollen eyes, crows feet, bags under eyes, dry skin, fine lines and eye wrinkles. Many factors such as hereditary, allergies, diet, leaking capillaries, or vitamin/iron deficiencies can help contribute to the overall appearance of dark circles under the eyes. It can also be simply a matter of not enough sleep, stress, sickness, or facial aging. As we age the area under the eyes become thinner and fragile. Due too fat loss under the eyes and transparent skin, more visible blood vessels may show, causing a bluish hue. Shadows and lines under the eye area can produce an undesired “old and tired look". To take years of your face and help retain a youthful complexion it’s important to also include an under eye care treatment by adding an eye cream to help preserve the youthful radiance of the eyes. This should be a part of every men’s and women’s daily skin care regimen. Today’ quality, scientifically advanced anti aging products will help correct eye aging symptoms such as lines, wrinkles, puffiness under eyes and dark undereye circles instead of relying on makeup and hiding under concealer. The area around the eyes is particularly delicate and thin and it is the first place to show signs of fatigue and aging. A anti aging eye cream product is especially formulated with emollients to protect, plump, and nourish this vulnerable area. The ingredients in day or night face creams and moisturizers are to rich and of a heavier consistency and not intended for the eye area. Eye cream treatments work to correct and diminish the visible signs of aging by smoothing fine lines, lessen wrinkles, lift sagging eyes, diminish swelling around the eyes, increase hydration and help prevent moisture loss, and restore a vibrant, brighter appearance. 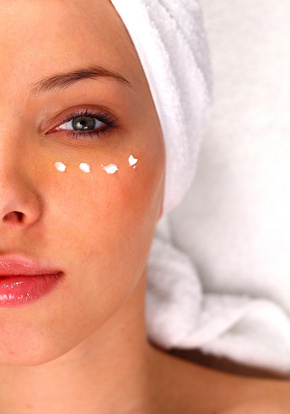 When selecting a cream for dark circles read the ingredients list. Finding the right cream it is important to look for high levels of the active ingredients that target the root of the problem. The key ingredients when looking for creams for dark under eye circles will possibly include Vitamin K, Vitamin E, Kojic acid, Licorice extract, or Vitamin C.
Vitamin K is an intensive under eye treatment ingredient that helps get right to the source to reduce swelling and remove discoloration. It helps repair and strengthen capillaries and enhance circulation. Kojic acid and Licorice extract help lighten and illuminate. Both Vitamin C and E is strong antioxidants that helps reduce wrinkles and help the skin to retain collagen and protect from free radical damage. Other top eye rejuvenation ingredients include- Retinol(the purest form of Vitamin A), Aloe, Green tea, Peptides, Emu Oil, Coenzyme Q10, Hyaluronic Acid(moisturizing), Haloxyl, Stearyl alcohol(tightens), Ester-C, Alpha Hydroxy Acid or AHA, Ceteayl Alcohol(helps thicken eye skin),and Evening Primrose.